The best selling shooter of all time Call of Duty 4: Modern Warfare is coming to Wii. Ported to the Wii by Treyarch, Call of Duty: Modern Warfare - Reflex Edition brings to Nintendo fans the intense and cinematic experience of Call of Duty 4: Modern Warfare, winner of 50 combined Editor’s Choice and Game of the Year awards. 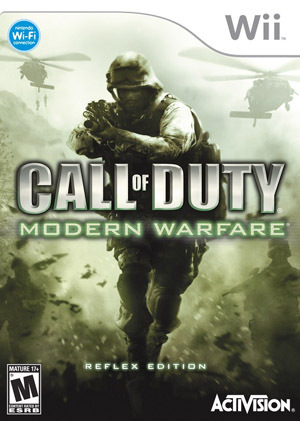 Call of Duty: Modern Warfare - Reflex Edition arms you with an arsenal of advanced and powerful weaponry and transports you to the most dangerous hotspots around the globe to take on a rogue enemy threatening the world. Incorrect display of pre-mission videos. When changing settings, loading videos will be shown, but the performance will drop significantly. Likely fixed with Hybrid XFB in 5.0-5874. The graph below charts the compatibility with Call of Duty: Modern Warfare - Reflex Edition since Dolphin's 2.0 release, listing revisions only where a compatibility change occurred.